The Vegan Mouse: Lentil Sausage Stew. Made this quick stew this morning so I would have food to eat as I go about my day wrangling an 8 month old. It's basically French lentils, celery, carrots, onions, garlic, one sliced Tofurky sausage, broth, tomatoes, tomato paste, soy sauce, cumin, thyme, salt and pepper and a pinch of sugar. I let it simmer for about an hour. 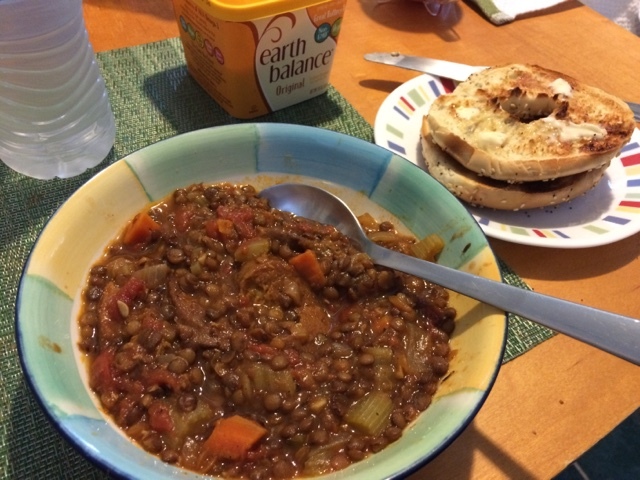 Lentil stew is one of my favorite meals!